Character: Called a California Style Amber by the brewery. Brewed with a wallop of citrus hops and specialty malts. Here is my second go round with Aztec Brewing Company out of Vista, California. I once reviewed their Chipotle IPA, which was a very good, and unique beer. I have to once again thank my beer brother, Jorge Espinoza of animebeers.com/Nubis Santcum Ales for helping me get this beer. This one is a beer that I really wanted for my collection due to the label. I really like the artwork of an Aztec blade being stabbed down through a heart shaped stone. The blade is covered with blood as it also drips down from the tip. It is a simple label, as there is nothing more to it other than this piece of artwork placed on a black background. Using a Victory Brewing Hop Devil glass, this beer poured a dark reddish amber color which over a bit of time cleared up pretty well. It was topped with a half inch, off-white colored foamy head. There was a thin layer atop the beer as I drank this glass of Sacrifice, which left lines of sticky lacing down the glass. The aroma was strong with sweet caramel, brown sugar, and toffee. There is a slight biscuit bread aroma mixed with a small hint of roasted malts. For me, the hops were present in the nose, but not as dominant as I would have expected. There is a citrus aroma behind the big malty nose with hints of orange peel, and grapefruit. There is a lingering citrus and brown sugar aroma at the end. The taste follows the nose. I wanted the hops to be more dominant and up front, but I was met with a big malty taste instead. Sweet caramel, brown sugar, and toffee hit the taste buds first, followed by a hint of toasted malts, and biscuit breadiness. Again, just like the nose, the hops were present, but just not as big as expected. There is a taste of citrus hops with orange pulp and peel with some grapefruit. There is a slight hit of booziness towards the end of each swill. The aftertaste is sweet brown sugar and citrus. The body is medium to heavy in size with a big chewy body. Moderate carbonation. The finish is dry. Overall, I did like this beer, but was my expectations were not met due to the descriptive words on the brewery’s website. I may have received a bottle that was a bit old, but not 100% sure on that. My notes did not include a bottled date, and I not recall if I ever even saw one on there. This one is definitely more of an American Amber/Red Ale, rather than a Red IPA as described on the label. I still gave this a 3/5 rating, as I would drink this beer again, and I would actually really love to try this again, possibly a fresher bottle. I could see where this beer was supposed to go, and I hope that I am able to get this again, and re-rate this beer. For now, I will leave it as is, but I will tell you that I do recommend this beer. 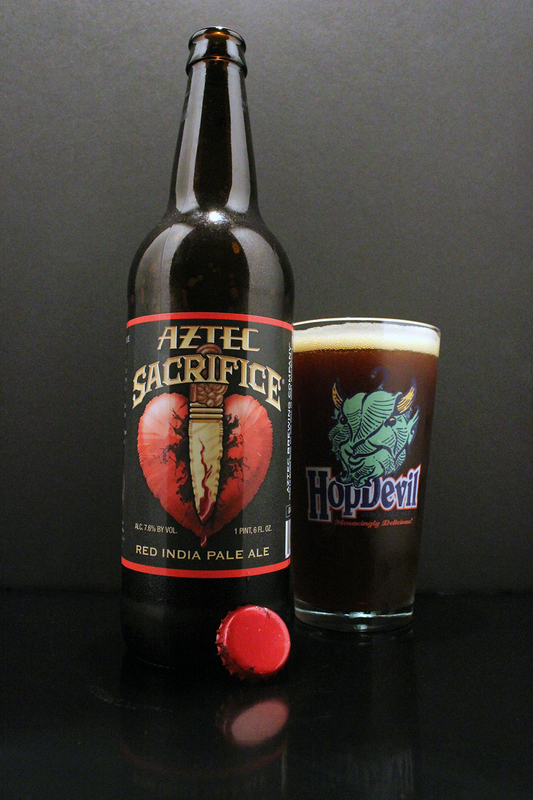 If you are ever able to get your hands on this beer from Aztec Brewing, do so. Metal Connection: Recently Rock ‘n Roll received one of the biggest blow in years, as Motörhead’s main man, Lemmy Kilmister past away at the end of 2015 from his battle with Cancer. 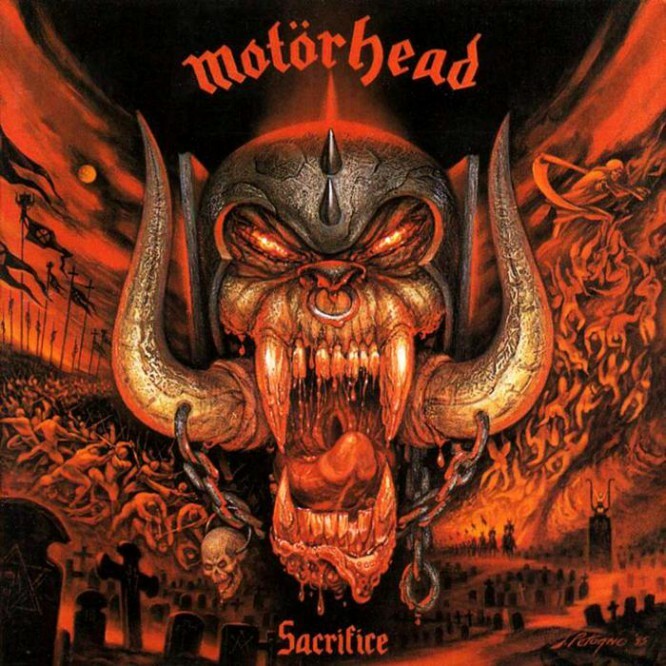 Motörhead is one of the most influential bands to musicians in Rock ‘n Roll, Punk, and even Metal. Their sound of Heavy Metal or Hard Rock rang in humanity’s ears from 1975-2015. Within this time frame, Motörhead released 23 full length albums along with some EP’s, and live albums. Of course, everyone knows this band from their 1980 hit, “Ace of Spades.” The song I feature here is the title track from their 1995 album, Sacrifice. Mikkey Dee’s thunderous drumming on this track, mixed with galloping guitar riffs, and the unmistakable voice of Mr. Lemmy Kilmister all make this a perfect beer drinking song. So grab your beer, get ready to chug it down, and head bang until your neck breaks, and head falls off. R.I.P. to the God of Rock ‘n Roll!